A recent bankrate.com survey of 1,000 Americans asked what was their preferred investment for money they would not need for more than 10 years. The answer - real estate. The results were interesting as this is the EXACTLY incorrect answer to the question based on 117-years of market data. 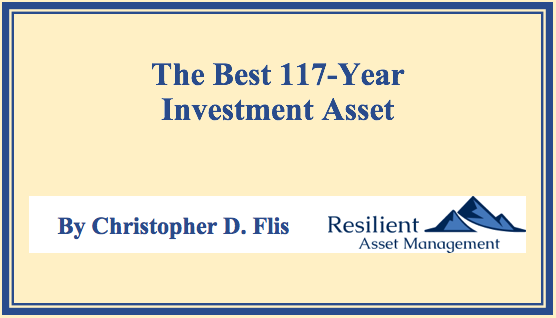 Much is talked about and written about what are the best asset classes for investors. Frequently, the headline of the day drives the conversation with comments similar to "Now is the time to buy", "Weakness in this sector is subsiding", etc...you have all heard the talking heads. What is frequently left out of the conversation are facts - as in hard data about what has actually happened over time for various assets. It is amazing to me that Wine - yes Wine - had better returns than a House. Moreover, the idea of collecting Violins never occurred to me. While these are entertaining anecdotes, the take away, clearly, is that World Equities (aka Stocks or the Stock Market) reign supreme in the world of investable assets. 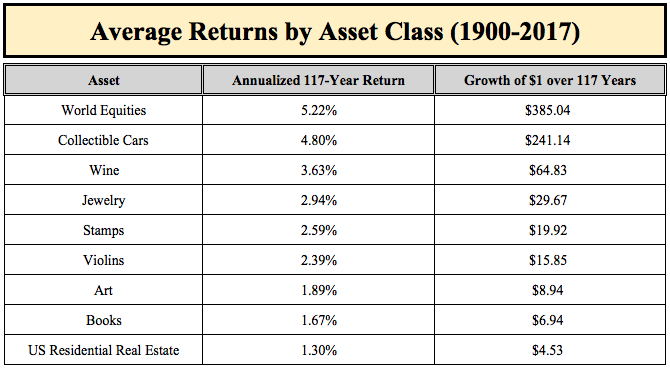 Furthermore, you can see that even small differences in return rates (5.22% vs. 4.80%) yield dramatically different ending account values, especially over a 117-year period. 1) Stocks - you have to be there. The table above should be convincing enough for you as far as where to go with your investments. And even better, gaining exposure to stock investments has NEVER been easier: Vanguard, Betterment, Fidelity, TSP (for military folks), or speaking with a Financial Planner - these avenues are all available to even the most novice amongst us. Market commentators permeate the financial media landscape, each with a seemingly believable approach to the "current market environment". For most, the preferred way is to establish your initial position and then systematically add to your investment over time via savings from your job. True, there will be peaks and valleys - however, staying the course generally pays off. For a case study in staying the course, please read this. For my Clients, we ALWAYS start with Estate Planning and then work through risk assessments (Insurance) before tackling tax and cash flow issues. Investments - believe it or not - take a back seat until those items are on the way to being taken care of. So please do not forget those all-important items before tackling your investments. With these other areas safely shored up, market fluctuations are far easier to stomach. Anyone with a vague familiarity with 401(k) plans is well-aware of the matching funds typically offered by employers. Simply put, there is no easier money you will ever receive. Effectively, this is an instant 100% investment return....this would make even a loan shark blush. Therefore, if you are not taking advantage of this benefit, you need to get to a point in your financial life where you are able to realize this benefit. For those in the military who were inducted under the Blended Retirement System (BRS) or for those who opted into it this year, matching funds are going to be the propellant that rockets your overall retirement benefits to parity with the legacy retirement system. So to reiterate, you need to familiarize yourself with these rules and avail yourself of this earned benefit. Due to the Income Tax changes, the value of home ownership - especially on the lower end of home prices - has been reduced substantially. This is due to the expanded Standard Deduction to $12,000 for Singles and $24,000 for married couples and the $10,000 limit on State and Local Tax (SALT) tax deductions. These two factors will drive the vast majority of income tax filers to the Standard Deduction, this eliminating the tax benefit of home ownership. Couple this with increasing property taxes and the carrying costs associated with a residence and your dream home can quickly become a financial nightmare. Some may argue that building equity in a home via home ownership will more quickly increase one's net worth. That is yesterday's (pre Tax Cuts and Jobs Act of 2017) truth. Now, the Income Tax Code makes renting much more attractive than previously. Neither way is absolute, so you have to run your numbers and see what makes sense for you. If you are not sure, ask a professional for advice! Don't simply blindly purchase a home - particularly via borrowing from a retirement plan - without calculating all your costs and assessing their impact on your personal financial circumstances. "Residential property should not be purchased with an exaggerated expectation of a large risk premium. It is equity assets that provide an expected reward for risk. The real case for equities is that, over the long term, stockholders have enjoyed a large equity risk premium."